There are so many reasons to "fall" in love with an autumn wedding! Invitations by Dawn has so many designs to capture your fall wedding style. 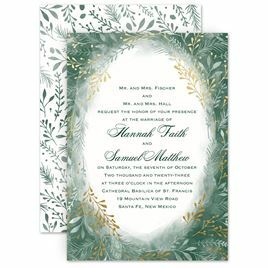 Invitations in seasonal colors like red, orange, yellow and brown will capture the beauty of nature. Wood grain, leaf and pine cone designs add rustic flair to the beauty of your celebration. Hearts also take on a look of natural elegance when they're printed in fall colors...and even designs that look "carved" into trees! 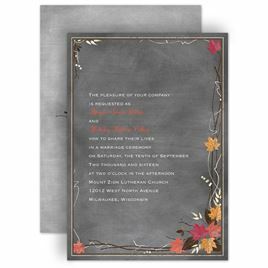 Rustic Wedding Invitations are also great for autumn so be sure to shop the entire rustic collection. 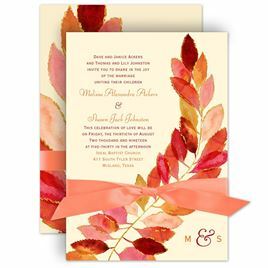 The perfect wedding invitation ensemble for a fall wedding also includes coordinating response cards and information cards. 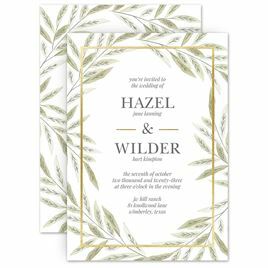 Shop all the designs available and find the one that complements your wedding invites beautifully. 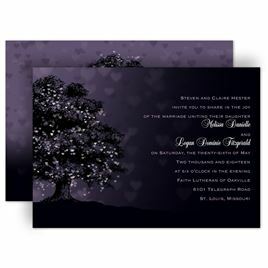 Your wedding guests are sure to be impressed with your attention to detail throughout the invitation ensemble.